A scholarship honoring Peter Jernberg was announced at an April Board of Trustees event celebrating his 26 years of leadership at Jackson Academy. On June 1, Jernberg begins his service as president emeritus. The James Peter Jernberg, Jr. Scholarship is aimed at attracting, retaining, and recognizing students with outstanding academic performance who also have demonstrated financial need. This scholarship will cover full tuition, fees, and other costs to attend Jackson Academy. The scholarship has been partially endowed, though additional gifts are being sought to sustain it. It will be announced in the Greater Jackson community this fall, and the first awards will be made for students beginning with the 2015-16 school year. Students selected for the scholarship must be entering fifth through twelfth grade, must be in the top five percent of their class, and must also show enthusiasm for and motivation toward maximizing his or her educational opportunities. Once the scholarship is fully implemented, grades five through eight will typically have one scholarship recipient per grade and grades nine through twelve will have two recipients per grade. The scholarship will allow twelve outstanding, academically gifted, deserving students to attend Jackson Academy who otherwise might not be able to attend. 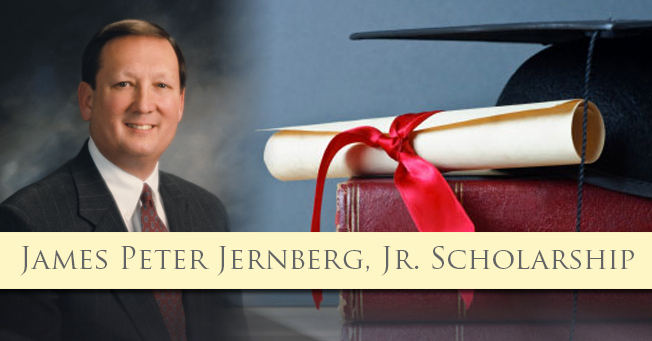 More information will be distributed in the fall of 2014 about how to apply for the James Peter Jernberg, Jr. Scholarship for the 2015-16 school year.